Surgical Facial Rejuvenation is a significant part of our Houston practice. Dr. Geppert utilizes advanced surgical techniques for face, neck and eyelid surgery that have profound anti-aging effect. Long lasting natural-looking results are achieved by not only addressing the skin but also the underlying fascia, muscles and fat. For significant results and harmonious facial rejuvenation procedures are often combined. When the facial skin loses its elasticity during the course of life, wrinkles and jowls form, deep creases develop between the mouth and nose, and bands around the neck can be seen. In order to smooth out those facial lines, during a facelift Dr. Geppert will tighten the skin and the subcutaneous connective tissue of the face. The patient’s features will regain their definition and the face will look fresher and younger. Facelifting is usually performed under general anesthesia. The incision is placed in front of and around the ear enabling Dr. Geppert to detach the skin from the underlying tissue. The exposed fatty and muscular tissue can be gently tightened and the excess skin removed. The facelift could be performed in conjunction with other facial rejuvenation procedures, such as, forehead lift, nose reshaping, eyelid surgery and neck lift. The bandages around the patient’s head and neck are removed the day after facelifting surgery at which point the patient may also shower and wash her hair. The usual swelling and discoloration of the face disappears after a few days. Most sutures are removed in one week. If the skin initially feels rather insensitive or tight, the symptoms usually disappear within a few weeks. Rarely, and mostly in heavy smokers, the wound may become infected or the blood flow may be impaired, delaying wound healing. The patient would be able to return to work in two weeks or earlier if covered with make-up. Depending on the skin type, a facelift will last 6 to 10 years. After that, repeat face-lifting is possible. Dr. Geppert performs a meticulous skin closure, avoids over-tightening the skin, and strives to achieve a natural and graceful facelift. When combined with other facial rejuvenation procedures the facelift results in a more harmonious, fresh, and youthful look. A forehead lift or “browlift” rejuvenates the aging forehead and brows and eliminates the angry and sad appearance resulting from age. During the forehead lift the eyebrows are raised and the muscles of the forehead weakened, thus smoothing the forehead and minimizing the frown lines. At Harbour Plastic Surgery in the Houston area Dr. Geppert can perform the brow lift either endoscopically or using the conventional surgical method. During the endoscopic brow lift Dr. Geppert inserts a small camera and instruments through minimal surgical incisions hidden in the hairline. In the conventional forehead lift the incisions are larger and hidden in the hairline, but the lift is greater. The forehead/browlift is usually performed in patients between 40 to 60 years of age, but it could be performed earlier in people with heavy brows or deep frown lines. The brow lift gives patients a more refreshed, youthful, and content look. The forehead lift is commonly performed in conjunction with a face lift and blepharoplasty (upper and lower eyelid lift) in order to achieve a complete rejuvenation of the entire face. Neck aging manifests as significant amount of excess skin in the neck area, as well as submental fat and vertical banding. This could be a consequence of aging, genetics or major weight loss. A neck lift tightens and lifts the skin of the neck and repairs the lax platysma (the superficial muscles of the neck). It improves the contour of the jaw line, and results in clean, sweeping and more youthful neck lines. The neck lift is performed through incisions around the ears and a small incision under the chin. All incisions are hidden in the creases of the skin or in hair bearing areas and thus minimally visible. During the neck lift the extra skin is excised in the areas around the ears to achieve a smother and tighter neck line. For a full and harmonious rejuvenation of the entire face and more dramatic results, the neck lift could be combined with a face lift, chin augmentation or submental liposuction. Neck liposuction is suited for people with localized fat deposits around the neck. The procedure is performed with very small suction cannulas through tiny incisions usually behind the ears and under the chin. A chin strap is worn post-operatively in order to achieve better results. Neck liposuction works best in younger patients with good skin elasticity. Post-operatively, the jaw lines are more defined and the neck appears longer and more graceful. The eyes are a very expressive facial feature. Wrinkles, saggy eyelids or bags under the eyes form when the skin and the muscles of the eyelids lose their elasticity, and can make you look old and tired. During an eyelid lift, Dr. Geppert removes excess skin and fatty tissue. The patients keep the natural shape of the eyes and their individual expression, but their face appears pleasingly younger and their eyes slightly larger. The eyelid lift could also be combined with a laser resurfacing procedure in order to improve the elasticity of the skin around the eyes and the entire face. The eyelid lift is performed on an outpatient basis, under general anesthesia, for upper and lower eyelid tightening as well as fat pad removal or repositioning. If a patient needs only upper eyelid tightening, the procedure can be performed in the office, under local anesthesia. Dr. Geppert will mark out the areas of skin and fatty tissue to be removed and make an incision along the fold of skin of the upper eyelid. During lower eyelid blepharoplasty the incision is made right below the eye-lashes, however the fat can be removed from the inside of the lower eyelid. Dr. Geppert also tightens the muscles of the lower eyelid in order to give the patient a more youthful appearance, and to prevent an over-operated look. After meticulously closing the wound, she will protect the eye with skin-friendly thin adhesive plasters. Full range of vision is immediately restored and pain is minimal. Any swelling and discoloration caused by bruising in the lower lid and cheek area subsides within one to two weeks. Cold packs can rapidly bring down any swelling. We remove the skin tape and stitches in one week after the blepharoplasty procedure. The eyelid lift will correct the drooping lids and puffy bags under the eyes giving the patient a more rested and youthful appearance. Nose surgery not only adjusts the external shape of your nose, but is also used to improve respiratory function. The rhinoplasty procedure is tailored to each individual patient’s desires and can achieve delicate refinements of the nose or dramatic change depending on the goals of the patient. The rhinoplasty surgery is performed on an outpatient basis, under general anesthesia. Two small incisions inside the nose provide access so that the cartilaginous and bony tissues can be reshaped. If more significant nasal reshaping is needed, or in the case of secondary rhinoplasty an open approach may be necessary which includes an additional incision along the collumela. Occasionally an alar wedge resection might be performed as well to narrow the base of the nose. Rhinoplasty incisions usually heal very well and are inconspicuous. A light plastic splint is placed to protect and support your nose for the first few days. Post-operatively the tissues around the cheeks and eyelids are initially swollen. This may impede breathing slightly. Sutures and splints are removed in one week. Post operative bruising disappears usually after two weeks, but it takes about six months for the permanent, new shape of your nose to be seen. The rhinoplasty procedure helps patients achieve a more balanced and refined nose that complements and enhances the rest of their face. Protruding ears result when the ear cartilage has not folded correctly before birth. During the otoplasty procedure Dr. Geppert can correct the shape of the ear cartilage. Ear pinning surgery is possible starting at five years of age, when the ears have completed most of their growth. During otoplasty the ears are reshaped and brought closer to the scalp. The ear pinning surgery is performed on an outpatient basis under general anesthesia. Dr. Geppert will make an incision behind the pinna (outer part of the ear) in order to reshape or reduce the ear cartilage. Scars are hidden in the posterior fold of the ear and hardly visible after a few weeks. Possible complications of the ear pinning surgery could be that the skin behind the ears might feel numb, but sensation eventually returns. Wearing a head bandage continuously for one week will help with the healing process. We recommend wearing a headband every night for two weeks post-operatively. After the optoplasty procedure the prominent ears are more proportionate to the face, more properly positioned, and thus less noticeable. Facial implants are used to improve deficient facial structures and enhance facial contours. The most frequently used facial implants are chin implants, cheek implants or jaw implants. Most facial implants are inserted through small incisions inside the patient’s mouth, so no facial scars are present from this surgery. Chin implants could also be placed through small incision under the chin. The facial implant placement can be performed at any age, and is frequently combined with other facial rejuvenation surgeries, such as face lift, rhinoplasty, or neck lift. As with all surgical procedures, there are possible complications with facial implant surgery, such as infection or displacement of the implant, however those are rare and can be easily corrected. When skillfully placed, facial implants improve the overall balance and harmony of the face and restore a more youthful appearance. At Harbour Plastic Surgery in the Houston area, Dr. Geppert offers permanent lip augmentation utilizing SurgiSil PermaLip implants. These lip implants are manufactured in the US and are made of a soft, solid silicone elastomer. The PermaLip implants are produced using an injection molding process creating a smooth, non-porous surface. The lip augmentatiom procedure takes less than 30 minutes to perform under local anesthesia in an office setting and patients can resume normal activity the following day. The PermaLip implants are the answer for patients who seek a “permanent” alternative to dermal lip fillers. The SurgiSil lip implants come in various sizes and lengths in order to accommodate the individual patient’s goals and anatomy. If a patient no longer desires fuller lips, the PermaLip implant can be easily removed in the office under local anesthesia, unlike the difficult and almost impossible removal of permanent fillers placed in the lip. The PermaLip implant has the advantage of being permanent, yet easily reversible. After the lip augmentation procedure patients enjoy fuller, sensuous lips that are maintenance free. Rejuvenation of the upper lip is an important aspect of facial rejuvenation. As the upper lip ages the distance between the upper lip and the nose lengthens leading to inversion of the lip, loss of lip fullness and loss of dental show. At Harbour Plastic Surgery in the Houston area Dr. Geppert performs an endo-nasal lip lift to treat the aging upper lip area. During the endo-nasal lip lift the upper lip is lifted and the incision is hidden in the base of the nose. The lip lift can be performed under local anesthesia in the office or combined with other facial procedures such as facelift or blepharoplasty, lip augmentation or fat transfer. Sutures are removed in one week and the scar is inconspicuous. After the endo-nasal lip lift the upper lip appears fuller and more youthful and the smile has more dental show. As the faces ages youthful facial volume decreases and one has a more gaunt and worn down look. 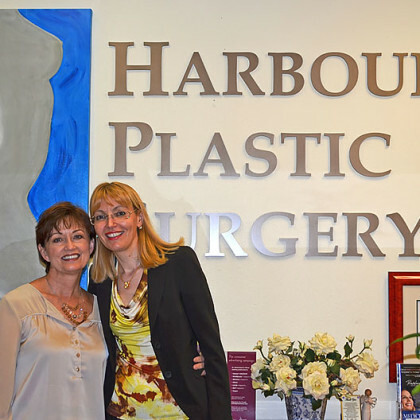 At Harbour Plastic Surgery in Houston we perform fat transfer or fat grafting to recapture the youthful fullness of the face after aging or massive weight loss. During the fat transfer procedure Dr. Geppert will harvest the fat from the abdomen or thighs and after purifying it she can inject it in the face. Fat is usually injected in the cheeks, nasolabial folds, under the eyes and in other hollow areas of the face. Fat grafting may be performed under local or general anesthesia and can be combined with face lifting or liposuction. There may be bruising or swelling for several weeks and only 50% of the fat usually survives. The transferred fat carries with it stem cells and sometimes improvement of skin texture could be noticed in addition to the youthful fullness of the face. Unsightly moles, cysts or skin cancers can be removed with excellent cosmetic results. Skin cancers or cysts are usually covered by most health insurances. The lesions can be removed in the office under local anesthesia. The excised tissue is sent to a pathologist for a microscopic evaluation. Larger lesions might require more extensive reconstruction with local flaps or skin grafts. Pain is minimal and controlled with over-the-counter medicine. Stitches on the face are left for 5-7 days and in other parts of the body 7-10 days. Unsightly, wide, thick and uneven scars can be excised and replaced with thinner, smoother and minimally visible scars. Scar revisions are usually performed in the office under local anesthesia unless the scar is very large and the patient desires general anesthesia. Pain is minimal. Stitches on the face are removed in 5-7 days and on the body in 7-10 days. The new scar is initially red and might take 6-18 months for it to mature and fade.